If you have one tearing around the house in hyper drive all day, it might seem only natural your little one resists when bedtime comes around since there’s always something left unexplored in their inquisitive toddler minds. Or, baffled parents might wonder why their two and three years olds have no trouble falling asleep on their own but wake up in the middle of the night screaming although they’re safe and cozy in their own bedrooms. These are just two examples of the sleeping issues common to toddlers and, while many of these childhood bumps are normal parts of their development and just a stage they will grow out of, left unchecked they can ruin your home’s nighttime peace and quiet. There are some easy remedies that tackle many toddler sleep issues. Step one is narrowing down the scope of the problem and deciding whether it’s been ongoing for some time or just made itself known. Younger toddlers who are teething could be waking up with that discomfort or the child might be sick for some other unrelated reason and their sleeplessness will resolve itself with a little loving care from you. However, you need to keep in mind those endless bouts of stalling and asking for just one more story before the lights go out could have other origins you might need to question . An addition to the family? Was your child presented with a new bed? Has there been an addition to the family recently? That could certainly upset the cart for a young toddler who has no reference points or experience on how to deal with a shift in their parent’s time and affection. On the other side of the coin, problems with your toddler’s sleeping habits could be the result of taking a longer nap in the afternoon. 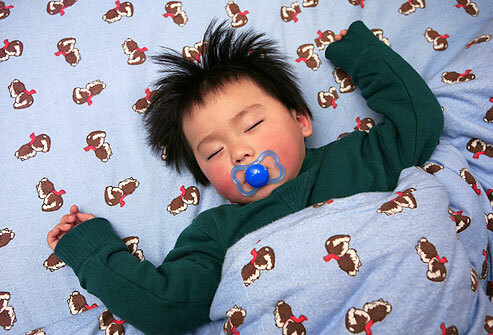 Some of the other fixes for toddler sleeping problems are a bit more proactive. One of the best ways to make sure your child sleeps through the night or falls back asleep on their own has to do with atmosphere. A comfortable mattress and warm blankets invite cozy cuddling and comfy pajamas add to the warm and secure feeling that’s inviting to any toddler. Setting the temperature so the room is welcoming can be the final piece of the puzzle. There are some things that you can do to smooth over your child’s sleeping issues before their tiny head hits the pillow and establishing a bedtime routine allows their biological clocks time enough to wind down. These bath, pajamas, toothbrushing, bedtime story routines give your toddler time to get used to the stages before the lights go out and allows you to wind down at a time when you’re probably dead on your feet and much less likely to be creative. Remember most routines for younger children create a security and expectation of what’s next. Read more info like this at All My Children.